For two days my boyfriend and I lived in a palace in Barcelona. It was summer and we were in love and we tried not to spill wine over everything. Two days is nothing—a mere 48 hours—but in Barcelona there are as many waking hours in each day as there are rings in the stump of an old tree. Barcelona makes you want to stay forever, add a siesta to your daily routine, and eat every dinner well past midnight. Many come to see Gaudí’s architecture, to sip cava and garnacha, to consume anchovies, jamón Ibérico, and paella, and to swim in the sea. We were no exception. As appealing as the Barcelona is, locals have recently protested the influx of tourists and it’s hard to blame them. Who wouldn’t want Barcelona all to themselves? So in an attempt to try to experience the city as locals (that is, locals who live a very different life than our own) we said farewell to the plethora of hotels and guest houses dotting the city and checked ourselves into El Palauet Living Barcelona. 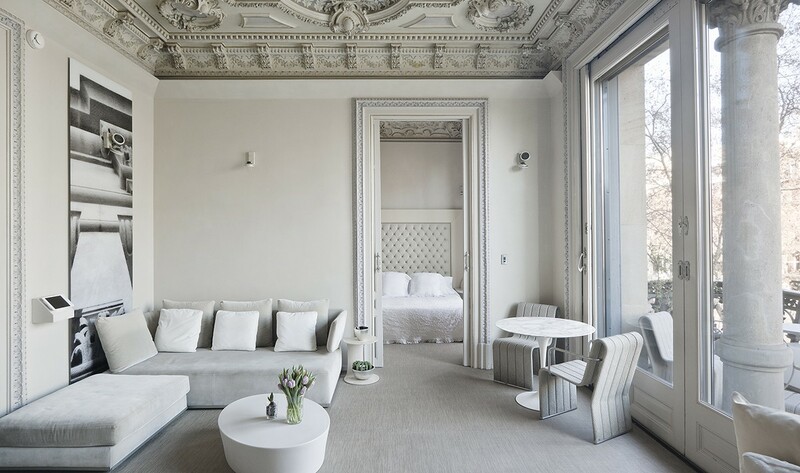 Built in 1906 as a palatial private residence, El Palauet (which means “Little Palace” in Catalan) once operated as a boutique shopping mall and now functions as a new concept hotel. Six large suites (over 1600 square feet) have been painstakingly updated and restored to preserve the original architecture and incredible detailing of the building while incorporating stunning modern features such as smart technology that controls seemingly everything except your heartbeat, expansive soaking tubs, and Japanese-style toilets. 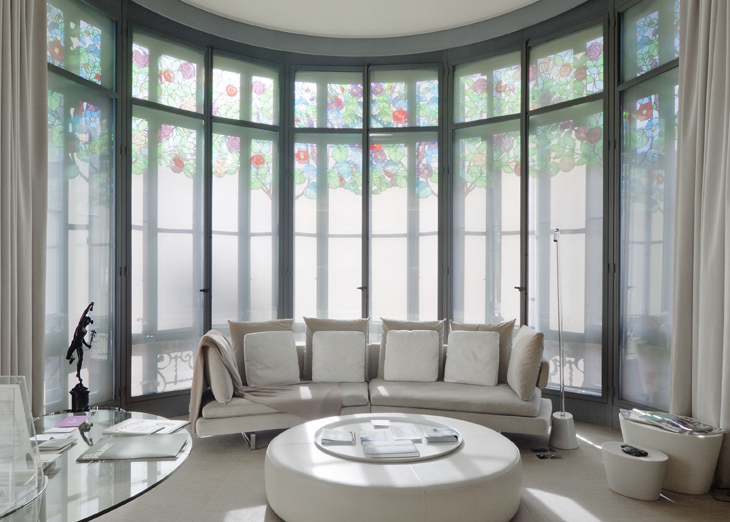 It’s luxury, but luxury with a conscious—the property is committed to kilometer zero products and other measures such as high efficiency energy-saving lighting. Although ornate, the hotel is nothing if not discreet. During our stay the hotel was full yet we never encountered other guests. Minimal signage on the outside of the property truly makes you feel like you are coming and going to and from your own residence. That is, a residence that happens to be historically and architecturally exquisite. 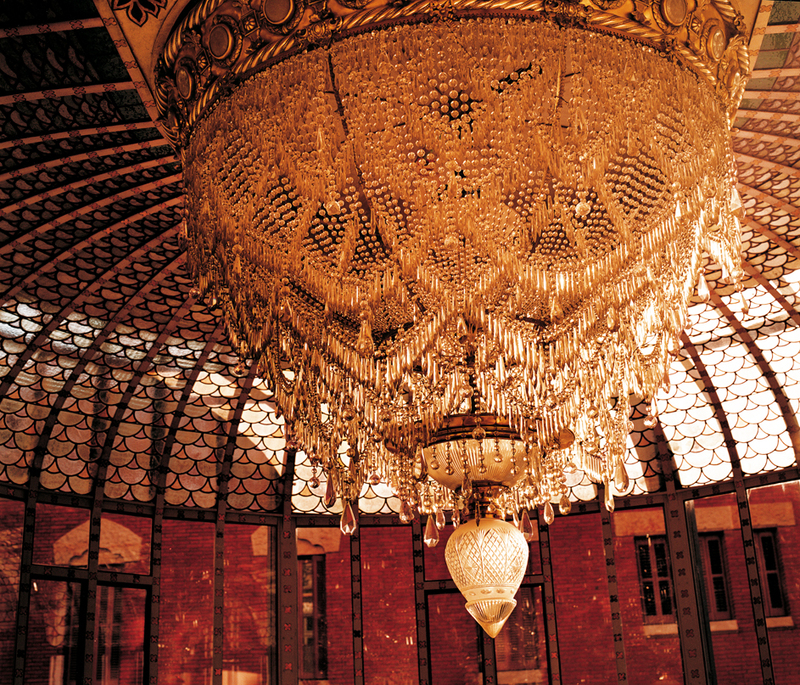 El Palauet features 45 unique ornate ceilings (no two are the same) and a chandelier made from 14,000 pieces of glass—a stunning piece that was installed when the mansion was constructed at the turn of last century. The expansive bay windows, stained glass, and striking mix of contemporary furniture (including pieces by designers Eames, Saarinen, Platner, Jacobsen, Van der Rohe, and Stark, and Citterio) in the old space is striking and pristine. But pristine it is in the fullest sense of the word. Decorated in virtually all shades of white and beige, red wine, pets, and children, although welcome, would make stays here feel far less secure. I recommend cava and white wine only. 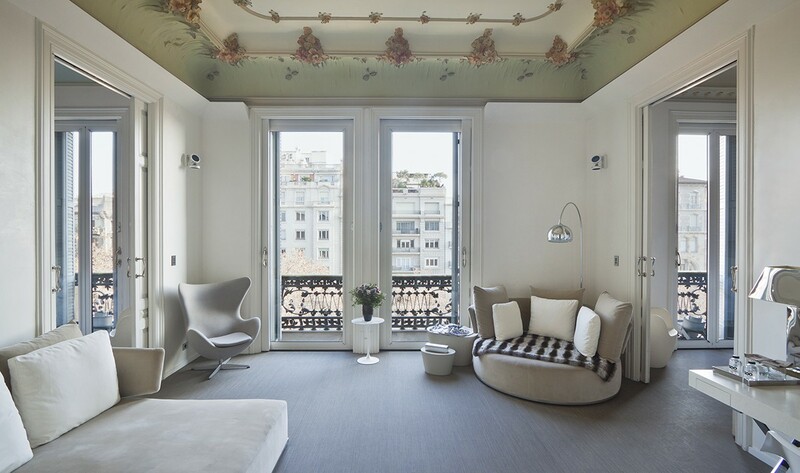 The neighborhood, L’Eixample, with it’s leafy, tree-lined boulevards, Gaudí-designed buildings (including La Sagrada Família) and shopping and dinning options will make you feel like a local. After all, you have a key to one of the city’s most beautiful mansions. Each suite comes with a personal assistant who can help with everything from advising you on the best beach, where to buy the simple glass wine tumblers that inhabit almost every restaurant in the city, or even prepare breakfast while you sleep. (El Palauet happens to be across the street from Turris, considered to be one of the city’s best bakery and all morning pastries come fresh and warm from the shop.) You may want to take advantage of that—after all, your stay won’t last forever. Photos courtesy of El Palauet.